Out of stock since Tuesday, 23 January 2018. Due back soon. For administration to pregnant cows and heifers to stimulate serological and colostral antibodies against rotovirus and coronavirus antigens against K99, Y, 31A and F41 antigens of E.coli in susceptible animals which may be passed to the calf to reduce neonatal diarrhoea infection caused by agents containing these antigens. 1 SA.U: q.s. to obtain an agglutinating antibody titre of 1 log10 in mice after an administration of vaccine. 1 SN.U: q.s. to obtain a neutralizing antibody titre of 1 log10 in guinea pigs after two administrations of vaccine. For administration to pregnant cows and heifers to stimulate serological and colostral antibodies against rotavirus and coronavirus antigens and against K99, Y, 31A and F41 antigens of Escherischia coli in susceptible animals, which may be passed to the calf to reduce neonatal diarrhoea infection caused by agents containing these antigens. Local reaction at the site of injection (≤10 cm), may appear after vaccination. This usually disappears within 14 days. A slight increase in mean rectal temperature (≤0.5 °C) may be observed on the day following the injection. Any injection of bacterial cells, even inactivated, may occasionally cause hypersensitivity reactions. In such cases, a symptomatic treatment should be provided. For vaccination of pregnant cattle. No information is available on the safety and efficacy from the concurrent use of this vaccine with any other. Therefore the safety and efficacy of this product when used with any other (either when used on the same day or at different times) has not been demonstrated. - First injection 1 to 2 months before calving. - Second injection 2 to 4 weeks after first injection, at least 2 weeks prior to calving. No data has been provided to support the use of a single dose booster regime. However, experience in the field suggests that a single dose of the vaccine administered two weeks before calving may provide enhanced antibody levels in the colostrum against the component antigens. Ensure that each calf rapidly ingests a sufficient quantity of colostrum. After administration of a double dose of vaccine, a local reaction at the site of injection may appear as a slight oedema evolving to a firm swelling, usually disappearing within 14 days of vaccination. A slight transient temperature rise (mean 0.7 °C) may be observed for two days following the injection. Shelf life of the product as packaged for sale: 18 months. Open bottle should be used immediately. Store between +2 °C and +8 °C, protected from light. 10 dose (50 ml) bottle. Any unused product or waste materials derived from such products should be disposed of in accordance with local requirements. 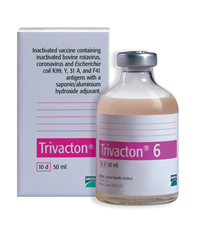 There are currently no questions for Trivacton 6 Immune Supplement - be the first to ask one!